Paul Liebrandt is one of America's most brilliant cooking talents. So why is he so drawn to cheap Chinese food? A peek into the mind and soul of a chef. 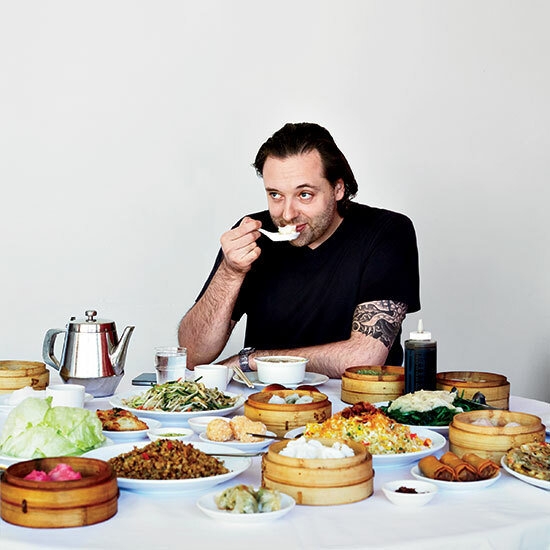 Paul Liebrandt, one of the great auteur-chefs of New York City cooking, who calls cerebral French chef Pierre Gagnaire "Papa" and created an infamous dish that combined eel, violets and chocolate, has a secret obsession: cheap Chinese food. Name a country—Scotland, South Africa, Germany, Switzerland—and Liebrandt can recall a dinner of dumplings, stir-fries, soups and noodles there. "Chinese food and pizza are the two things you can find anywhere in the world—and I just think that Chinese food has more depth to it," he says. This has led Liebrandt to some less-than-delicious meals. In Scotland, he ordered a duck stir-fry, but when it arrived, something seemed off. "I'm looking at it, and can't really tell what part of the duck it comes from," he says. "It's cut all funny and I'm not sure if I'm looking at a leg, a breast... Is it even duck? It was swimming in a murky brown sauce and they'd topped it with a handful of glazed cherries." Other times, the food is decent, but the setting is dicey. On a late night in Philadelphia, Liebrandt stopped by the only restaurant that was still open. While he was slurping his chow mein, a fight started. "About 15 guys jumped up, flipped the whole table and got into a massive brawl," he says. "What was amazing is that the waiters just ushered all of them out onto the street, then cleaned up the mess, righted the table, reset the silverware and said, 'Next!' like nothing ever happened." Occasionally, there are moments of greatness. Stuck overnight in Lille, France, near the Belgian border, he went to the local Chinese restaurant, "as you do," and found amazing wonton soup and a textbook dish of sweet-and-sour pork. As Liebrandt reveals in his new memoir, To the Bone, an early exposure to Chinese food helped push him into the kitchen. Born in Zimbabwe (then called Rhodesia), Liebrandt was raised in London; his parents lived on busy Charing Cross Road ("the equivalent of living in Times Square," he says), near the city's small Chinatown. "I remember my grandmother taking me out to a Chinese restaurant when I was 10 and I was fascinated by it... It was just so different: not the usual carrots and cauliflower, but bok choy and all sorts of exotic vegetables. I've always been curious and inquisitive, so I had all sorts of questions: Why is that pork hanging in the window? What's a wonton? And then I just wanted to try everything." As he got older, he would take walks by himself through Chinatown—as an escape route. "I didn't want to be in the house with my parents; they eventually got a messy divorce," he recalls. "I had to get out, and Chinatown was just there. Right on the corner of Gerrard Street, there was a restaurant called China China. In the window, you could see a woman standing and making the wontons. I remember the steam on the window, the smell from the street and then trying them—the thin wonton skin bursting, then you get this succulent shrimp and pork. Then the broth, which looks light, but has this depth of flavor. It's something I've always loved." He pauses for a minute. "If I had grown up in New York City, maybe it would have been the Union Square Greenmarket, and I'd be in love with produce. But it was London's Chinatown, and now I love Chinese food. That's my comfort food." He's not using a traditional definition of "comfort food" here—wonton soup doesn't really remind him of home (which has been a restaurant kitchen since adolescence) or of his mother's cooking (mostly prepared dinners from a local department store). Instead, with each sip, he's reminded of the hard work that turned a pile of chicken bones and meat scraps into a light, golden-yellow broth; the careful simmering and skimming that keep the soup clear; the mind-numbing hours of repetition that every single dumpling maker endures to create these ingenious packages of dough and filling. In other words, he's reminded of the reason he became a chef. Liebrandt started his first real kitchen job at the age of 16 at London's L'Escargot, where he learned to make veal jus, nine different potato preparations and all the building blocks of French cuisine. From there, he went on to work with some of the greatest European chefs of our time—Marco Pierre White, Raymond Blanc and Pierre Gagnaire—absorbing their techniques, philosophies and aesthetics. It wasn't easy: His first job paid the equivalent of $150 a week, and Liebrandt slept on a mattress on the floor in a room with five other cooks. Even as his food became more and more complex—at the now-closed Gilt in New York City, a single entrée order would actually consist of as many as seven different preparations of one ingredient—and as he rode the wax-and-wane fortunes of his career, Liebrandt always found solace in his beloved wonton soup: The flavors clear and simple, a contrast to the unusual juxtapositions of his own dishes; the restaurants' humble, clamorous atmospheres a pointed contrast to the hushed dining rooms he oversaw. In Paris, he frequented Kok Ping, right off the Champs-Élysées, directly opposite Pierre Gagnaire's flagship. When Liebrandt moved to New York City in 1999, he was blown away by Chinatown spots like Joe's Shanghai, Ping's and Golden Unicorn. "In New York, Chinatown is like a city within a city," he says. "It's incredible." Liebrandt isn't exactly a recluse—he will happily share stories about his days as a DJ on the UK's rave scene if you ask—but he stands apart. He still goes to the movies alone, opts out of the television and festival circuit and relies on solo Chinese-food excursions to escape the unrelenting pressure of the kitchen. "That's one of the greatest things about a Chinese restaurant," he says. "You can sit down by yourself, order dinner and no one blinks." After cycling through a handful of restaurants—and, at 24, becoming the youngest chef to earn three stars from the New York Times while at Atlas in 2000—Liebrandt settled into a fruitful collaboration with restaurateur Drew Nieporent at Corton in Tribeca, a gallery-like space where he earned an F&W Best New Chef award in 2009 for dishes like From the Garden—more than a dozen vegetables, each prepared in a different manner, arranged into dioramas that recalled a Monet canvas. This past summer, Liebrandt decided to open a more casual restaurant, The Elm (theelmnyc.com), inside the King & Grove hotel in Brooklyn's Williamsburg neighborhood. The Elm is Liebrandt's bid at making "simple food, really." But only in Liebrandt's rarified, fastidious world is this food simple—meaty slices of turbot fused around a layer of bright green garlic-and-shrimp mousse, then served over a nage of fresh peas, bacon and lemongrass. "Simple food means what? Making fried chicken and burgers? That means simple?" Liebrandt asks. "Maybe that's the stereotype, but I'm not a stereotypical person." In Liebrandt's mind, The Elm's food isn't complex or precise, it's just "well-prepared"—which is where his old-guard French cuisine and traditional Chinese cookery dovetail. Both respect the value of a clean, strong stock and the hands-on skill of a kitchen craftsman, whether one is making quenelles or xiaolongbao. There isn't anything recognizably Chinese on The Elm's menu, but Asian flavors are very present. The gnudi come with a silky broth that tastes like some Milanese millionaire's idea of Thai tom yum—tart, fragrant and luxurious. Today, Liebrandt spends six nights a week at The Elm, so he doesn't cook much in the Manhattan kitchen he shares with his girlfriend, Arleene Oconitrillo, who is also a partner in the restaurant. But in the past, he worked up his own version of wonton soup, based on the idealized version in his memory and "well-prepared." "You just have to make the stock super slowly, don't boil it and keep skimming it, so it stays clear," he says. "Then, for the wontons, you just mix up the filling, divide it, pinch the wrapper, twist it and cook them in a bit of the broth. Take them out, divide them into bowls, ladle in the broth, serve with some scallion and sesame oil, and that's it. It's easy. Really easy."